SAN BERNARDINO, Calif., September 7, 2010– As a National Public Lands Day project and beyond, the US Forest Service is seeking volunteers to help remove brush around the precious Parry Pinyon pine trees to help protect the trees in case of a wildfire. Two species of Pinyon live in the San Jacinto mountains, both culturally important to the Cahuilla Indians and other Southern California Tribes. Volunteers will help clear away and pile the vegetation growing near the trees. Work will be in pre-selected areas and take place over three weekends from Friday morning through noon on Sunday. On each Saturday, efforts will take place on adjacent Ramona or Santa Rosa Indian Reservation lands and provide opportunities to share cultural background on Native pinyon harvesting and other traditional plant gathering practices. Come and join us. When: Sept 25-26 (National Public Lands Day on the 25th); Oct 2-3; Oct 9-10. Where to Meet: Friday morning at Thomas Mountain area or Saturday morning at the Pinyon Campground. If you will be joining us during the day, please contact Daniel to arrange on where to meet. Work parties will be organized and depart no later than 8:15 a.m.
What to bring: personal camping gear, food, snacks, water, hat, sunscreen, gloves. Temperatures will be mild and pleasant. Loppers and hand clippers or handsaws welcome. Camping:Campsites will be provided at Pinyon Campground in Pinyon Flat. Pinyon Flat Campground has water and toilets. Pinyon pine trees are found in the Santa Rosa and San Jacinto mountains. There are two species of pinyon: Pinus monophylla and P. quadrifolia. 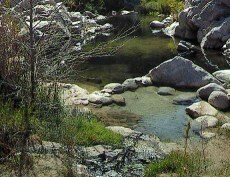 Both species are culturally important to the Cahuilla Indians and other Southern California Tribes. The southern end of the Thomas Mountain and Garner Valley areas are the northern extent of the Pinus quadrifolia or four-needle pinyon (aka Parry pine), and its range extends deep into Baja California. Pinus monophylla (single needle pinyon) is found on the desert side of the Peninsular Range, usually between 3800 and 6000 feet in elevation. Today, with nearly 100 years of fire suppression activity and the suspension of native burning and traditional gathering practices to help manage the “wild” lands, vegetation is very dense in the areas where these trees grow. While the San Bernardino National Forest fuel reduction program continues across the Forest to remove dead trees after the devastating last few years of drought and insect infestation, our efforts will focus on removing the brush around the Parry Pinyon pine trees. This will be an ongoing project. The concern is over the amount of vegetation build-up (undergrowth) near these trees. If a wildfire breaks out then these trees would not survive. By removing the undergrowth, they would be less affected by fires. By clearing away the vegetation and limbing lower branches, it will allow a wildfire to burn around or under the trees and not consume them. Over the last three years, efforts to protect specific trees were made in the south Thomas Mountain area, on the Ramona Indian Reservation on the west side of Thomas Mountain, and on the Santa Rosa Indian Reservation. Previous volunteer projects have treated over 85 acres and several hundred trees.